As if bacon weren't tasty enough, imagine it crumbled and rolled with cheese into a flaky, tender crescent roll. This appetizer is guaranteed to please. Unroll dough; separate into 4 rectangles. Firmly press perforations together to seal; top with remaining ingredients. Roll up, starting at one short side of each rectangle. Cut each roll crosswise into 4 slices. Place, cut sides down and 2 inches apart, on baking sheet; flatten slightly. Use kitchen shears to easily cut the bacon instead of chopping it with a knife. Cover baking sheet with foil, then spray with cooking spray before using to prepare pinwheels. 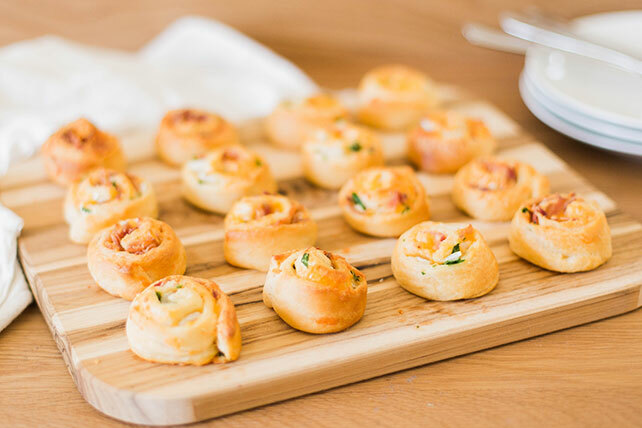 These flavorful pinwheels make a great addition to any brunch table. If serving a crowd, double the recipe using 1 pkg. (2.52 oz.) OSCAR MAYER Fully Cooked Bacon.